OpenOffice.org is an excellent all-around productivity suite as it is, but you can add a few useful features using extensions to make it better suited for use in a business environment. Here are a handful of extensions worth considering if you are using OpenOffice.org as a business tool. 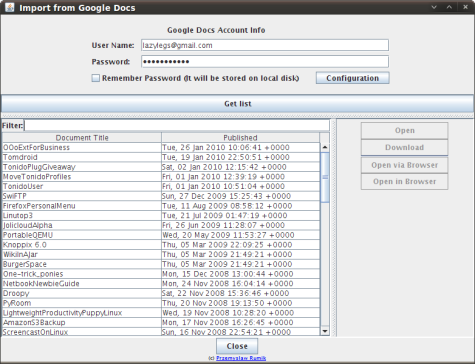 Right from the start, Google Docs has been a useful complement to OpenOffice.org. Since this web-based office suite supports the OpenDocument format, you can send documents back and forth between OpenOffice.org and Google Docs. While this works fine when you have to upload or download documents every now and then, transferring dozens of documents between OpenOffice.org and Google Docs can quickly become a nuisance. The OpenOffice.org2GoogleDocs (ooo2gd) extension solves the problem by allowing you to easily upload OpenOffice.org documents to Google Docs as well as open existing Docs files in Writer. The upload feature supports not only ODT documents, but also SXW, DOC, and RTF. Moreover, ooo2gd can send spreadsheets in ODS, XLS, and CVS formats as well as PPT and PPS presentations. The download part of the ooo2gd extension is still in the experimental stage, and for now, you can only open Google Docs documents in Writer as plain text files. While OpenOffice.org Base is a rather powerful database application, its default reporting capabilities are not up to scratch. To beef them up, you need the Sun Report Builder (SRB) extension. It not only adds a few advanced features, but also makes the process of creating a report more straightforward. Since SRB acts a lot like Base’s Form Designer, creating a report is as easy as drawing fields and specifying their properties in the Properties window. SRB also offers easy-to-use sorting and grouping capabilities, so you can group and sort the data in the report by specified criteria. Besides simple text fields, SRB supports calculation fields called functions that you can use for manipulating data in the existing fields. Let’s face it, tabbing through cells in a Calc spreadsheet is not the most efficient way to populate them with data. The DataForm extension provides a faster, and more intuitive way to enter data into cells, and sports a couple of other useful features to boot. 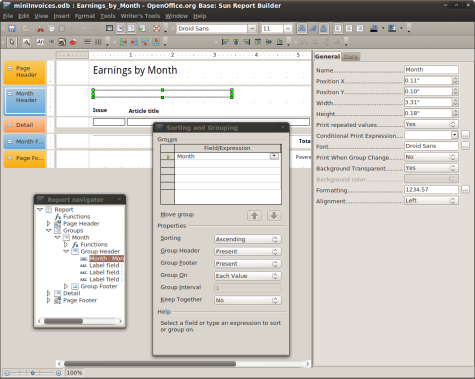 While OpenOffice.org has always sported the ability to talk to MySQL databases, connecting the productivity suite to the popular database engine wasn’t particularly straightforward. Establishing a connection to MySQL involved installing and configuring a connector software, which did require some skills and made the whole idea less attractive. 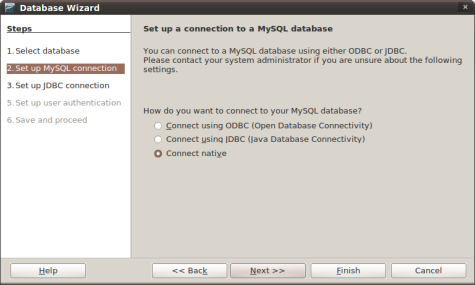 Fortunately, the MySQL Connector extension integrates support for MySQL databases right into OpenOffice.org Base. Once installed, the extension adds the Connect native option to the database connection wizard which allows you to specify connection settings. If you are dealing with PDF documents on a daily basis, you’ll appreciate the Sun PDF Import extension. Once installed, you can open and edit PDF documents in OpenOffice.org. While the extension won’t replace a dedicated PDF editor, it can come in handy when you need to quickly edit or comment a PDF document. This entry was posted in Open Source, OpenOffice.org and tagged Open Source, OpenOffice.org on January 27, 2010 by wlmanager.